We now deliver and set up RV & Travel Trailer Rentals at Silverstrand State Beach Campground, Call us for more details or to make a reservation! Discount Trailer Rental Rates now available for Silverstrand State Beach Campground, call us for more details! 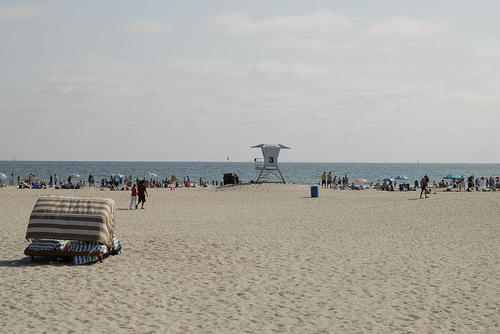 Silver Strand State Beach Campground located in San Diego County on the island of Coronado. Silver Strand is on the beach and only offers dry camping. Silverstrand SB Campground does not permit tent camping, therefore you must have an RV or Travel Trailer that is self contained and that has a bathroom and sink, if your camping vehicle doesn’t have this you will be turned away. Silverstrand State Beach Campground will not allow you to sleep out your trailer in a tent. Also, the beaches north and south of Silver Strand are military property and they will not let you enter these areas. Spaces at Silver Strand or either beach front or inland. This campground is a large parking lot with the beach sites along the sand , so a beach site is a must at this Coronado Campground. Alcohol is permitted inside the camping area but not allowed inside the day use or beach area. Check in time for the park is 2:00pm which they are firm with. If you would like to see photos of Silver Strand SB sites or the beach you can do so at SanDiegoCoastlife.com. This campground is perfect for beach camping in San Diego. Take HWY 5 southbound past Downtown San Diego, take the Coronado Bridge over the bay to Coronado Island, and head left on Orange Avenue HWY 75 south. From 5 FWY northbound, exit Palm Avenue west to HWY 75 north. Once you enter the park you will drive past the day use area back into the campground. All of our travel trailer rentals at Albert’s RV Rental are self contained and meet all park regulations at Silver Strand so you won’t have to worry. You can pick up one of our units and go camping at Silverstrand. 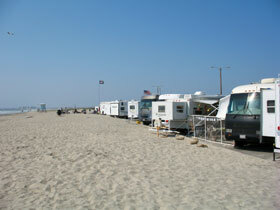 You can make your reservations for camping at Silver Strand Beach Campground reservations www.reserveamerica.com. Make sure you book your reservations early as this campground books up far in advance. Another choice in the area is Campland on the Bay, in Mission Bay. They are a private campground that offers RV sites with full hook-ups and is right on Mission Bay in San Diego. They offer a private sandy beach area and you can park your boat close to shore. *Horseback riding is 20 minutes away**Silver Strand does not permit Horse back Riding on beach. Camping on Coronado Island can prove to be one of the best vacations.